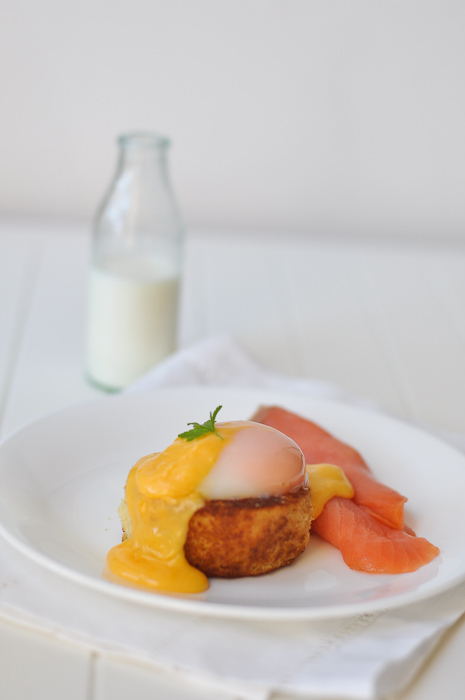 Slow Poached Eggs and Hollandaise on the Thermomix – is it cheating? A few weeks ago our washing machine broke. After 5 years the old fella decided to call it a day. My husband and I went shopping for a new one on a Sunday and were informed that someone would call on Monday to let us know when the delivery could be arranged. Monday came and we were dealt with the news that it would take six weeks to receive a new one. The prospect of wearing dirty clothes for the next six weeks was frightening and we promptly cancelled the order and ordered the washing machine elsewhere and got it three days later. It was surprising that a few days ago I got not one, but three different calls from a company trying to arrange a time for me to receive that cancelled washing machine. Despite my telling them that I had cancelled the order the calls still kept coming. On the last call, I admit, I thought (for a second) that maybe I should just take the delivery. I could maybe sell it on ebay or place an ad on our community bulletin board. But common sense prevailed and told them for the final time the machine wasn’t mine. For the longest time I resisted getting a thermomix. Making things like mayonnaise, custards and tempering chocolate becomes a breeze with this machine. I thought a true test of one’s skill was to be able to make this all from scratch. I wondered, was using the thermomix cheating? It's not a science project! It's a slow poached egg! My philosophy is simple, using the thermomix is just another way to cook. If I wanted to whip some egg whites I could place it in a bowl and beat like crazy using a wire whisk. I could use my kitchen aid, or any of the four hand held beaters I have (yes, I have four… don’t ask why)… or I could use the butterfly attachment on the thermomix on speed 3 or 4. If I wanted to poach an egg I could drop some eggs in a pot of simmering water or try this recipe here. More recently, I’ve discovered that the thermomix is one of the best ways to slow poach eggs. The eggs are cooked in their shells for around 40 minutes at a very low heat, similar to the technique that Momofuku uses, but because the thermomix can regulate temperature, there is no need to watch the pot for the duration of the cooking. I could stand infront of a stove over a bain marie to make a velvety smooth hollandaise , or I could drizzle some warm butter into a running blender that has some egg yolks to create this sauce – or I could chuck everything into the thermomix and eight minutes later I’m done. The point is, to each his own. In 1960 commercial food processors were introduced and it took almost 12 years before food processors were created for domestic use. I am sure there were also a few raised eyebrows and unbelievers when they were first released but today, it’s hard to find a household without a food processor or stick blender. I am sure in time, people will also come to embrace how easy it is to use the thermomix. I’m not going to go into all the great things you can do with this machine, you can read all about it over the internet, but some resources can be found here, here and here. But I do think the fact that it can make a perfect poached egg and hollandaise alone is worth it. Because I never buy bottled hollandaise. Now, that would be cheating. You will need four eggs. Fill the thermomix bowl just below the 2 litre mark. Place four eggs (in their shell) into the steam basket and add more water until the 2 litre mark is reached. Cover the thermomix with the lid. Heat at 60c for 43 minutes on speed 3. Remove from the thermomix and gently crack the tops and tip the eggs into a small saucer. Serve immediately. Can someone please tell me how to double the amount for this recipe? Hoping to make it for 8 people this coming weekend! Just curious if anyone has done more than four eggs in the basket at one time? Hoping to try 8 tomorrow. Ok I’m making them right now! Yum! I did a slow cooked egg the other night following a recipe 60oC for 60 minutes, the 60 minutes commencing after it reached 60oC. Only a bit of the white was slightly runny and was the yummiest egg EVER!!!!! I am about to do this too. I’m wondering if it will overcook the eggs by leaving them for another 10minutes, while I make the hollandaise? Hi I love poached eggs (and my Thermomix). Just wondering if you start with cold or hot water. You want to cheat at hollandaise? Get the same amount of egg yolks, heat gently over a bain marie, and whip in about 2g of soy lecithin (can be easily bought at a health food store) and then pour in all of the melted butter, whip, and voilà, instant hollandaise sauce. And it will not split. That’s guaranteed. Thanks for the tip Joseph! What about the lemon juice? Wow that baby is versatile. I used to hate poached eggs because my father would put them in noodle soup and not let me leave the dining table until I’d eaten it though it tasted like rubber. Only recently developed that I like them now. Wish I could taste your perfect rendition! Trissa, this Thermomix is quite a wonder, isn’t it?… I will have to check it out the next time I am in Australia! Hey hey Shirley… it’s your lucky day… they DO have Thermomix in Singapore too! It really is an amazing machine. completely agree. what a great punch line ending to a good post! =) what happened to the egg’s white though? seems just the yolk has been poached. cant tell you how many times i’ve lost an egg in the blundering waters of my pot. still trying to get the hang of cooking a poached egg. i think cooking it this way isn’t cheating at all. like using a bread maker to make bread? just different ways that’s all. I suppose we all grow into our different methods and preference. Yes it’s only mostly the yolk that has been poached, in fact the rest of the egg whites aren’t meant to be used. No, not cheating at all. It does allow you more time, energy and motivation to try other foods, and I love the point about needing to understand the (food chemistry) principles to be able to convert a recipe. I have a question though? You mentioned that the egg whites aren’t meant to be used. This makes me sad, I love the whites, (as well as a good, runny yolk) and wonder if you’re applying this to any poached egg, or just the ones done on a low temp over 47 minutes? Thanks for your time! Hi there – you can definitely use the egg whites – it’s just my preference to remove it – plus it is a bit runny so some of it falls of when slow cooking at the 47 minutes. I’m so intrigued by your Thermomix–seems like a do-all type of appliance. This means I need it! 🙂 And no, it’s not cheating to find something that makes things easier in the kitchen w/out compromising quality. I don’t think there was any compromise here at all. One learns something every day, Trissa. Thermomix was new to me…I actually had to Google it. Guess we haven’t had this product in the US, but there were some links, so I guess it’s possible. That is a perfect egg!!! Shhh, it’s not cheating if you don’t tell anyone! That egg looks so perfect I could cry! I had never heard of a thermomix before,..thanks for introducing it to me!! That slow cooked poached egg looks just wonderful! Cheating, schmeating – you can make these things without a machine anyway – so you have the skills, now you are just prioritising your kitchen time more effectively! I’ve never seen a thermomix in action before this post. Wow. That brunch dish looks professionally made! I’d pay good money for it! yumm! Thanks for the recipe. I have a thermomix but have been a bit lax at sourcing new things to try with it. I made the poached eggs this morning. But when I cracked one at 43 minutes it was still uncooked. Again at 47 mins. Should the eggs have been at room temp before cooking them? Perhaps that it an unwritten egg law that I unwittingly violated. And how did you do the sauce and eggs in the thermo. Did you keep the eggs warm for the 8 minutes whilst cooking the sauce or cook the sauce first and run the risk of it splitting when reheating. Or is there a trick? Hi Paul – My eggs were straight out of the fridge when I made the poached eggs… At 47 minutes were the eggs still not cooked? They are supposed to be runny though. With regard to the sauce, I poached the eggs first but left them in the shell – then I made the sauce. When I was ready to serve, I ran the eggs over some hot tap water and then that warmed them up a little bit then I cracked them and poured the warm sauce over. Hope that helps! With no disrespect to the end product or your blog post but given your context, wouldn’t using a device like a Thermomix be considered cheating? The way I see it, it’s one step away from giving the ingredients to a chef and getting them to make it for you. Not to say that I wouldn’t do the same myself if I could afford, and was inclined to purchase, a Thermomix. I made hollandaise in the Thermomix this week. Loved how easy it was. I didn’t know I was supposed to use the paddle. Thanks for the poached egg recipe. I’ll give it another go. It is not cheating. Your egg looks perfect. I WANT A THERMOMIX. Its like the queen of all kitchen gadgets. It can do everything. I believe that time is precious and anything that can save me time is a keeper. I love poached eggs and your eggs are perfect. I sometimes have people tell me they think that using a Thermomix isn’t ‘real’ cooking, but I really can’t understand their logic, when they’ll quite happily use other appliances… Anyway, there’s a lot of things I never made before I had a Thermomix, like hollandaise sauce and sabayon and mayonnaise and sorbet – I LOVE it!!! Great job Trissa, you’re really showing me up….hahahaha…I did try it when you asked, and had minimal success, the timing is the thing. Lovely pics! The eggs are perfectly poached. Not at all cheating…exactly like what you said: just another way to prepare the food. I love my Thermomix – and yes, I do have two… but I earned one, and bought one. By earning one, I edited a cookbook etc… and took a machine instead of money. Did I say I love my Thermomix? And, we have the same voltage in Canada that they have in the US. There are no US distributors. The sheen on the egg is lovely. Looks wonderful. Do you make the hollandaise first and just reheat it? Wow, that egg is beautiful. I really must look into this thermomix. I am so intrigued by it. As far as cheating goes, while its nice to know and understand techniques, there’s no harm in using the technologies that are available to us. Thank you for this excellent post and GORGEOUS photos about the possibilites of cooking with Thermomix. I had the same trepidations as you… I was/am such a hands-on cook… wasn’t sure how I felt about ‘cheating’ with a Thermomix. But after one year of cooking with Thermomix I am can staunchly say that Thermomix is NOT cheating. Thermomix has expanded my culinary horizons, and has pushed me to attempt things I never thought possible. It allows me to be more creative, and to prepare full, natural meals for my family on impulse (read, ‘more frequently’), because the prep time is so reduced and the outcomes are so dependable. In addition, I have learned a great deal about the fundamentals of cooking science, because in order to create my own recipes, it has been necessary to first research and gain a true and deeper understanding about what makes the recipe ‘work’ before attempting to convert it to Thermomix. Is it cheating to learn, experiment, play and enjoy preparing food even more than before? No. Thermomix is not cheating… Thermomix is FUN. Learn something every day. Didn’t even know there was bottled hollandaise! I’m so lucky my sister has a thermomix!! haha….wow! The thermonix sounds so cool!! It doesn’t sounds much like cheating at all- just having fun!! Bottled hollandaise sauce is just wrong! i kept wondering how TMX could make the eggs perfect. I was concerned as most of the time my eggs turn out slightly over or slightly under.. unfortunately that is only determined when its too late! Oh Trissa.. You are a hilarious woman. I can just hear you now “But wait! There’s more…. Call in the next 30 minutes and you’ll receive this set of steak knives. Pay with your credit card and you’ll get a second pair for your friend” You crack me up! Well…, if it is cheating, then a lot of commercial kitchens are cheats (especially function kitchens) although they are slightly bigger – massively bigger than the home version. I’d love having one at home, so am quite jealous. I want thermomix!! How do I get one?!!! I think I’ll move to Sydney! and, no, it’s not cheating at all.. if that gorgeous perfection comes out of it. only thing I ask, gimme! The current society doesn’t give us a lot of spare time to cook and bake like the olden days. So if a gadget helps to speed up the cooking time, why not?